This peak, located at the tail end of the West Mountains, is not in the book. Revised April 2018. 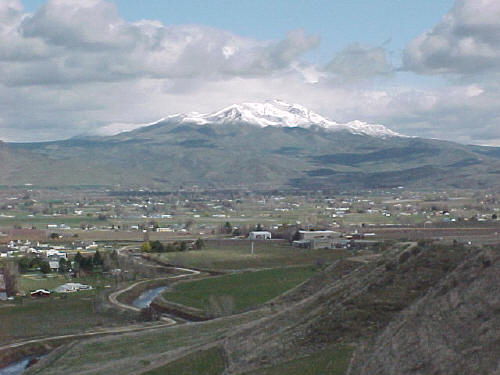 Squaw Butte is located north of Emmett, Idaho. 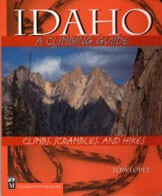 The butte is a large, complex mountain with many faces and high points. Although commonly referred two as a single peak this massif has three points with over 300 feet of prominence spread apart by a distance of nearly two miles. The butte is better described as a small mountain range than a single peak. The three high points from south to north are Squaw Butte South, Squaw Butte and Squaw Butte North (aka Peak 5626). Each of these peaks is separated by significant saddles. Squaw Butte is the southern terminus of the middle ridge and the ridge’s most rugged expression. Three points on Squaw Butte have more than 300 feet of prominence. Most people incorrectly believe the fire lookout which is located at the southern end of Squaw Butte South is the highest point. The fire lookout is not even the summit of Squaw Butte South. 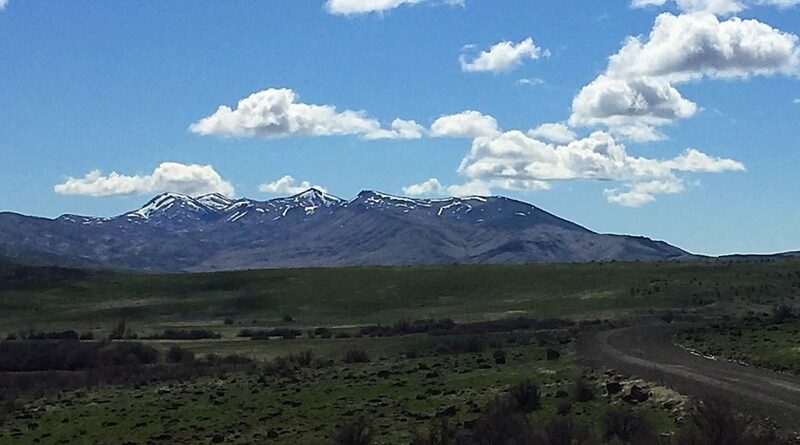 Squaw Butte South has an elevation of 5,894 feet and the lookout’s elevation is 5,874. The true summit is located well to the north of these two points. 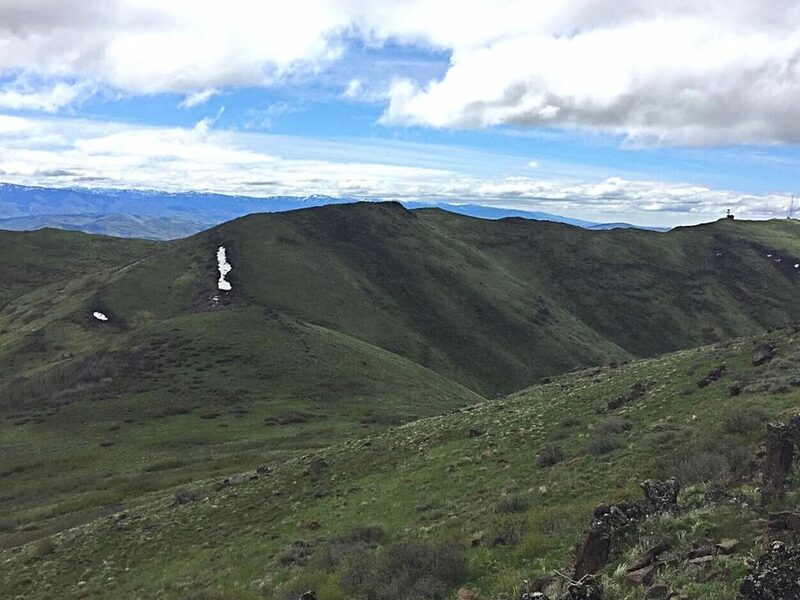 While the actual high point of Squaw Butte is only two feet higher than Squaw Butte South, if you want to claim an ascent of Squaw Butte, you have to go the extra mile. 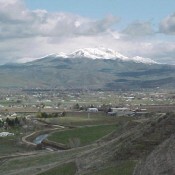 Squaw Butte rising above Emmit, Idaho. Squaw Butte’s highest summit viewed from Squaw Butte South. 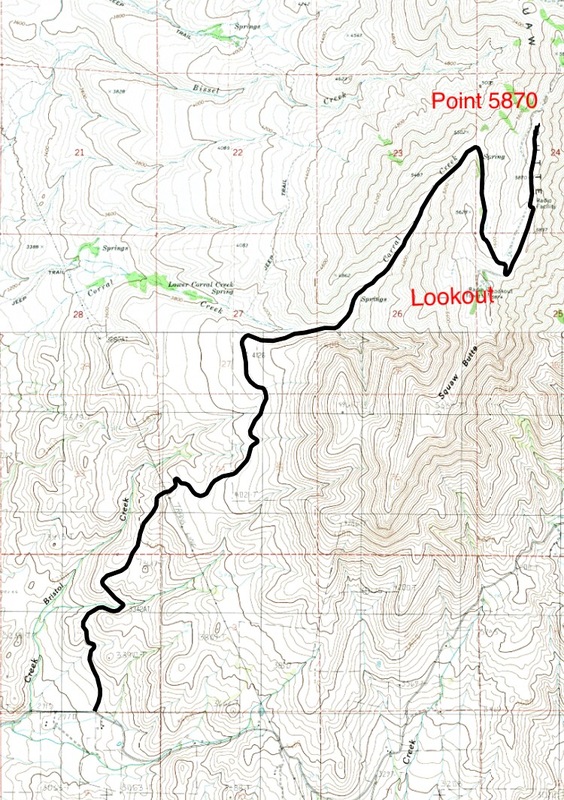 A maintained road leads to the fire lookout on the south end of Squaw Butte South. This road is generally passable to 2WD vehicles to the saddle below the lookout. From the saddle a rougher road leads north to point 5870 and a large brick building. Beyond this point the road is only advised for 4WD vehicles. This rough, steep road follows the ridge north past the slopes of Squaw Butte South, Squaw Butte and Squaw Butte North. This section of road can be nasty when wet but does make a good tread for hikers. To reach the peak from Emmett leave ID-16 at its junction with Washington Avenue North. Follow Washington Avenue (which is also designated ID-52) north through town. North of town ID-52 swings east. Continue straight at this point onto Van Duesen Road. Follow Van Duesen north until the pavement ends. Turn right onto Butte Road and follow it for a short distance until you see a cattleguard on your left. Turn left, cross the cattleguard and follow the maintained dirt road to the saddle below the lookout. The road is closed in the winter. 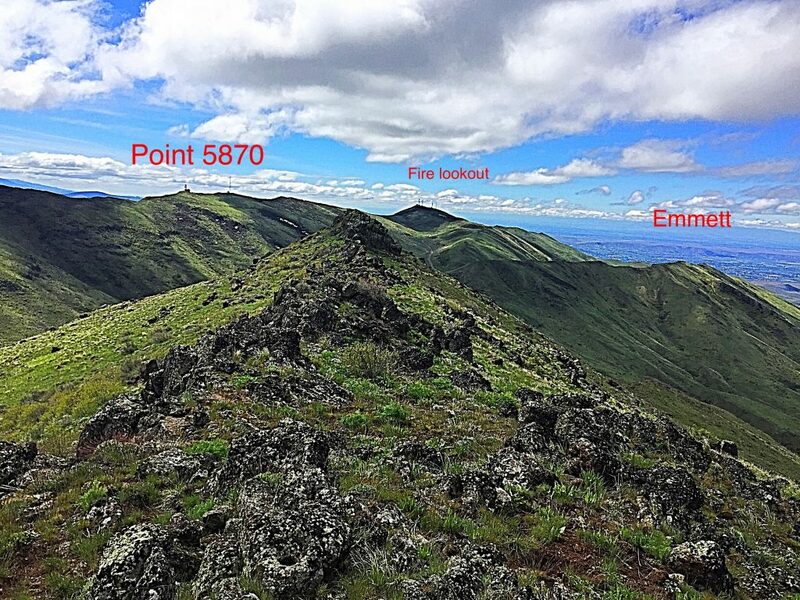 The easiest way to climb Squaw Butte is to follow the road described above to the peaks eastern slopes and climb directly up the grass and brush covered slope to the summit ridge aiming for a point just south of center. The summit ridge is a long narrow rock rib. You can find a Class 2 line up the last 20 feet or do a short scramble to reach the high point. The crux for this route is crossing a barb wire fence midway up the slope. 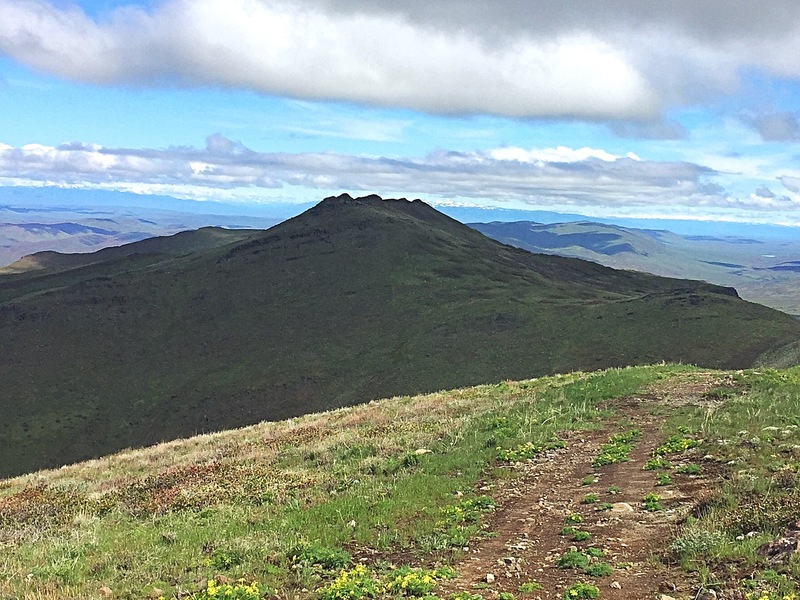 You can also reach the summit by following the ridge line north from Squaw Butte South. There are a few brushy spots to navigate around but this is a more direst route. Squaw Butte South viewed from Squaw Butte. My elevation profile between Point 5870, crossing over Squaw Butte South and on to Squaw Butte. 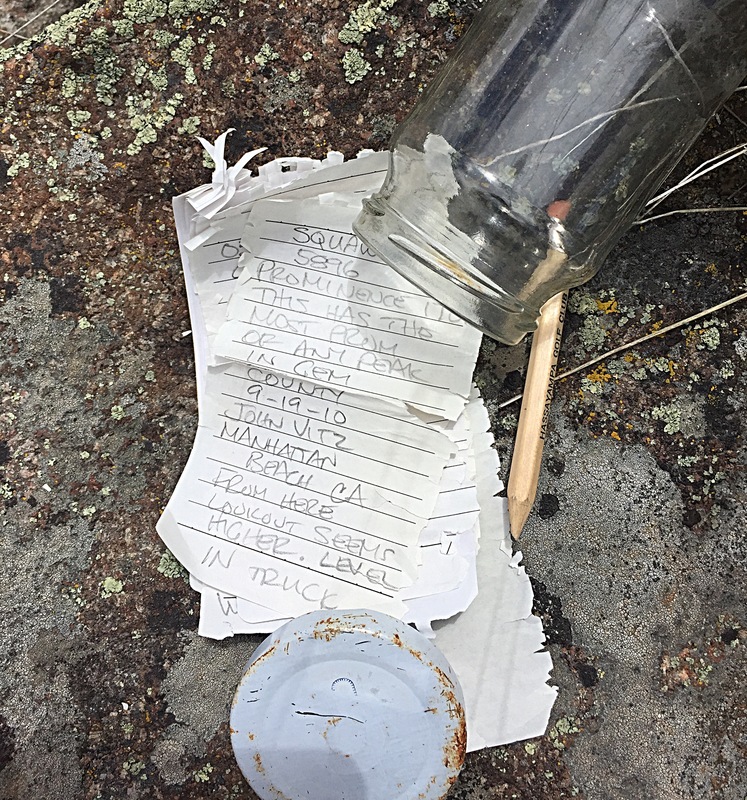 The summit register I found on Squaw Butte May of 2017. Squaw Butte viewed on a hazy day from Shafer Butte. This shot show the large size of the Butte.